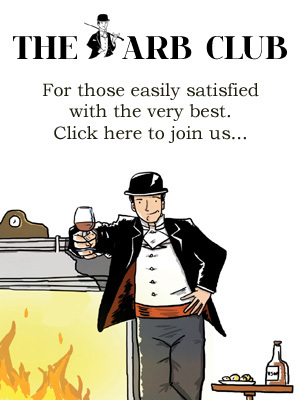 If the number of features in the newspaper weekend supplements are anything to go by it seems we’re all spending this summer picnicking our little socks off. Hmm. I have my doubts about that. The thing is, unless Fortnum’s are going to be dropping off a hamper, picnics can be quite a lot of hassle to cater for. There is a second ‘unless’ and that involves going back to the roots of ‘le pique nique’ by asking each of your guests to bring along a dish. My control freakery would sadly prevent me from throwing that sort of picnic but I can certainly see the appeal for those not so afflicted. And if I were to be a guest at one, my contribution would most likely be a simple, hearty, flavoursome salad like this one. It’s a welcome counter to the sausage roll / pork pie meat-fest that picnics can too easily become. You can probably take it as read that at a potluck picnic those kind of things are going to be taken care of. And thank goodness, a picnic without a scotch egg is barely worth the name. Those foods are so very travel-friendly that they highlight the obvious problem with fish: transporting it can be tricky on a muggy summer’s day. But when you’re only in charge of one dish rather than a whole feast it surely becomes hardly any bother at all to bundle it in with a few ice packs and a big serving spoon. We’re in mackerel season now. Particularly good news as it has made its way back onto the ‘can eat’ list. 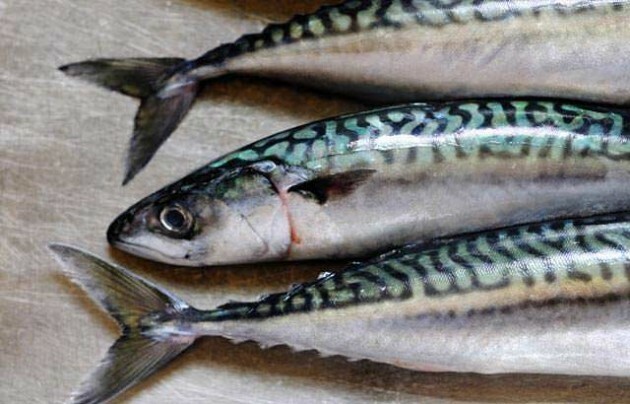 Go for Cornish line-caught mackerel if possible – online suppliers include ‘Fish For Thought’ and ‘The Cornish Fishmonger’. Just try to avoid ones from Iceland or the Faroe Islands. This recipe calls for smoked mackerel and there seems to be renewed interest at the moment in home-smoking foods. I’ve never done it so am absolutely no help to you on this save to say that it sounds quite a laugh and bragging rights are assured. With home hot smokers available for upwards of £50 its definitely on my to-do list. 1. Boil the new potatoes until tender and leave them to cool. As the mackerel are smoked they don’t necessarily really need cooking but I like to – 12 minutes in a 200C oven. Let those cool too. 2. Slice the potatoes into whatever size pieces you fancy and break up the mackerel fillets with your fingers. Put both into a large bowl. 3. Peel and dice the cucumber. Add that to the spuds/mackerel. Trim the spring onions, chop them quite small and add those too. 4. Combine the oil and vinegar. Pour it over the salad ingredients and mix well. Chop the dill and mix that in too. 5. Finish with a good squeeze of lemon and quite a hefty sprinkling of salt. I’m kidding both me and you if I pretend that I could ever reign myself in enough to only take one thing along this pretend pique-nique picnic. I might also take something like a bottle of cherry syrup. 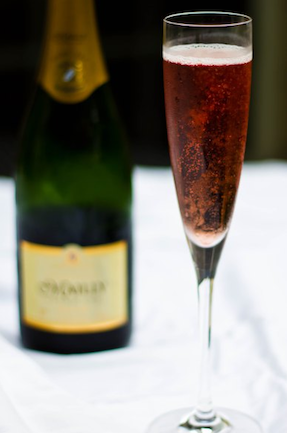 Very versatile: with fruit, drizzled over a sponge cake, to jazz up sparkling water or added to glasses of the champagne that someone else is bound to have brought. Put the sugar, water and vanilla extract into a medium saucepan and heat until the sugar dissolves. Add the cherries and give them a brief going over with a potato masher. Bring to the boil and then simmer for 25 minutes. Run through a strainer, prodding at the fruit to get out as much of it as you can. If you’d like to thicken it up even more then just return the liquid to a pan and simmer for another 15-20 minutes. Store in sterilised bottles. I’d best leave it at that before my picnic contribution list grows and grows and I end up needing one of Mr Fortnum’s lovely vans just to get it all there. 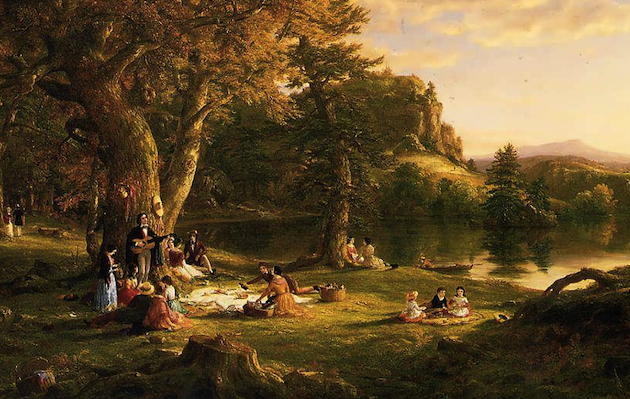 Painting detail from Thomas Cole’s ‘The Picnic’ (c. 1860).